Do you know how to reef your mainsail when the wind gets overpowering? If not, you really should learn how. If you already know, is your sailboat rigged so that you can reef and unreef quickly in high winds while underway? If not, besides a jiffy reefing line like I describe in Single line jiffy reefing, you’re going to want to install mast gates of some kind. I won’t get into all the nuances of reefing in this post. There are many other excellent resources for that. For a condensed, illustrated description along with many other sailing techniques, consider reading my review of Royce’s Sailing Illustrated Volume 1: Tall Ship Edition. Without mast gates, one or more sail slugs will fall out of the sail feed slot when you reef the mainsail. That means someone has to go forward to the mast to reinsert the slugs when you hoist the mainsail back to full height. Mast gates close the sail feed slot to keep the slugs in the track when you reef and unreef the mainsail. They turn reefing from something that you have to do well ahead of time to something that you can do as just another sail trimming option. Another option is to have a sail loft install a jack line in the bottom of the sail luff. Together with a sail stop secured above the feed slot, the jack line allows a portion of the mainsail to fall below the boom when the mainsail is reefed and the slugs stay in the track above the slot. There are only a few aftermarket sources for mast gates but one stands out from all the others, mastgates.com. They specialize in innovative mast gate designs for all makes and models of sailboats. The company is owned and operated by retired nuclear medical field service technician and avid West Wight Potter 19 owner Tom Luque. Tom has invented a number of patented designs to fit different mast profiles and sail feed slot designs. He also has different styles for moored sailboats and quick release styles for trailer sailors. He was kind enough to send me three of his products for evaluation: a new internal nylon pop-in sleeve, external tethered mast gates, and a quick release track stop. Tom’s latest design, a pop-in plastic sleeve, slides entirely inside the sail track and is held in place by a combination of tension and the ends of the sleeve. A slot in the sleeve is the same width as the sail track in your mast. When the sleeve is installed, it restricts the sail feed slot but lets the slugs slide through unimpeded, just what you want when you reef and unreef the sail. You install or remove the sleeve by squeezing the sleeve slot closed and sliding the sleeve into or out of the sail slot. Two pins protrude from the back of the sleeve into 3/16″ holes that you drill in the back of the sail slot. They prevent the sleeve from sliding up or down in the sail track. To bend on the mainsail, you again squeeze the slot closed but slide the sleeve down inside the track just far enough to open the slot so that you can insert or remove the sail slugs. Then you slide the sleeve back to its previous position. Here’s a short video demonstration. I’ve been using one of these for about a year and it works well at keeping the slugs in the sail track. I’m able to hoist and douse my mainsail in various wind conditions like there is no sail feed slot. The nylon that the sleeve is made from is surprisingly strong and tough. I like that there are no external parts for lines to foul on and that the sleeve stays in the track unless I need to remove it for maintenance, such as cleaning or lubricating the track. 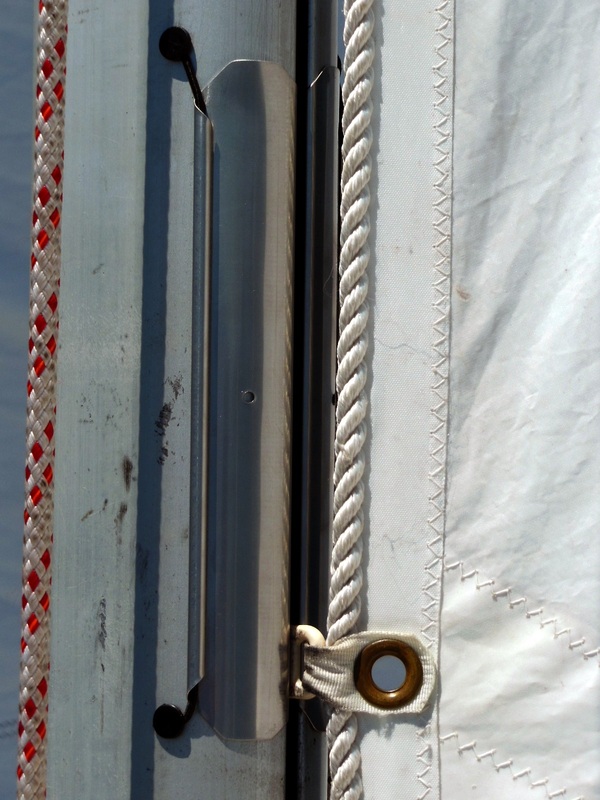 The pop-in sleeve mast gate is a good choice for sailboats that are moored when not in use or in masts for which a different style doesn’t work well. You can order the pop-in sleeve mast gate for Catalina 14.2, 16.5, 18, 22, and 25 model sailboats in a variety of colors from Shapeways.com. Most mast gate designs by other manufacturers are variations of an external gate. They typically vary only in how they attach to the mast. Only mastgates.com offers an ingenious tethered gate design that uses small shock cord to attach the gates and acts as both hinges and springs. The gates are fabricated from 316 stainless steel. To install these mast gates, you drill four small holes outboard of the gate corners, insert the ends of the shock cords, and fasten them with plastic retaining pins. Here’s a short video showing how to install them, including cutting a 1/32″ recessed pocket for the plates to rest in before drilling the holes. After installation, you simply push on the rolled outer edge of a gate to unlatch it from the sail feed slot. The gate swings out of the way by itself. To close the gates, just swing them shut until the folded outer edge latches over the sail feed slot again. Here’s a video showing how easy they are to operate. This mast gates design also work well at closing the sail feed slot for easier reefing and dousing. The tool-free, snap open, snap closed operation couldn’t be more convenient. However, at first, I did experience slugs catching on the gates inside the track on occasion. Since the gates are held in place by the shock cord tension, they can slide up or down the track and foul if the problem slugs aren’t cleared. For this reason, you want to be sure the gates fit as tight to the inside of your sail track as possible. Tom has a helpful video about this on YouTube. After I improved the fit of the mast gates, the fouling problem went away. If you continue to experience fouling, you can drill two additional holes beneath the middle of each gate and insert the included 3/16″ plastic pins in the gates to prevent sliding. The external tethered mast gates are a good choice if you frequently bend on and remove your mainsail, such as for trailer sailing. They only take seconds to open and close. They would also work for sailboats that are moored if you prefer an external, tool-less design. UV exposure will limit the lifespan of the shock cord if it is continuously exposed to sunlight but Tom says that he has not had any failures over the years he’s been making this design. Regardless, he also offers replacement cords and plastic pins for sale on his website. Order several replacements when you purchase your mast gates and you’ll be prepared in advance. The final product from mastgates.com that I evaluated isn’t a mast gate at all but a handy accessory for your mast track that can help with bending on a mainsail or other situations where you would use a track stop. I like to use it to hold the boom at the right height during setup or for more headroom while at anchor. 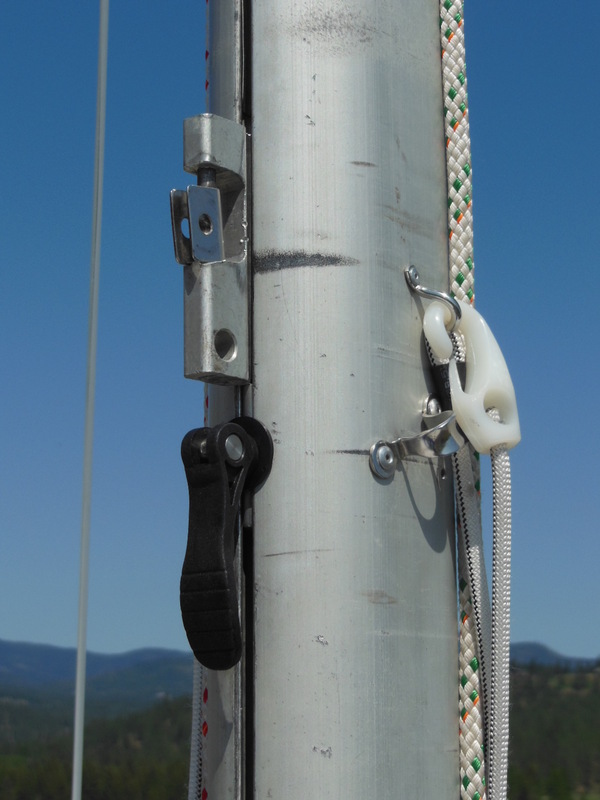 Many masts have a track stop that can be moved in the sail slot and fastened in place with a knob. I hate my original track stop on Summer Dance. The knurling on the knob is mostly worn off and the previous owner filed flats on three sides of the knob, which don’t help much. Together with the flat slide in the track that binds easily, the original stop is a hassle to use. 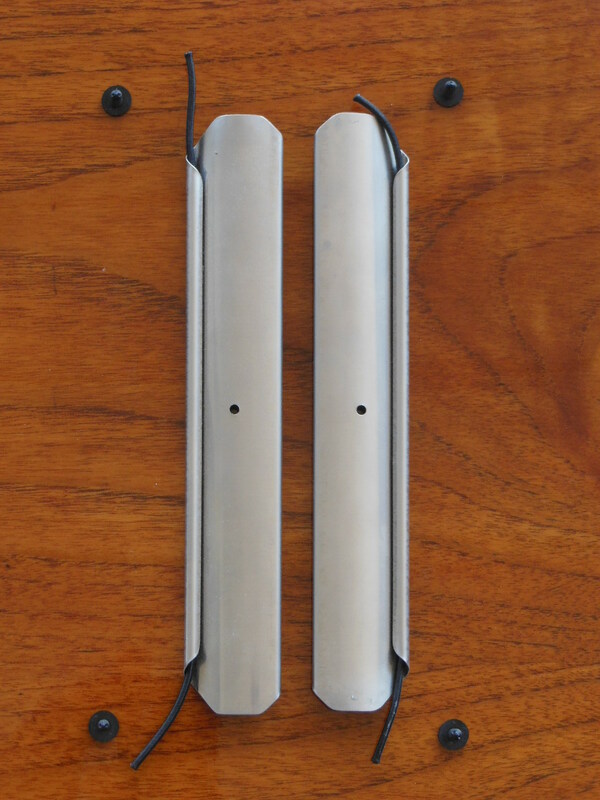 The Quick Release Track Stop (QRTS) from mastgates.com works on the same principle but with a round aluminum slide and a high quality plastic cam lever instead of a knob. You simply raise the lever to move the stop to a different position and depress the lever to clamp it in place. The round slide moves easily without binding. The Quick Release Track Stop couldn’t be easier to install. No tools are needed. Just slide it into the mast track either through the sail feed slot or from the open end of the mast. I found that, depending on which end of the slide I inserted first, I was able to get a lighter or firmer clamping action with the same number of lever rotations. Tom gave me this handy tip on installing the QRTS. If you insert a short piece of round metal or plastic that has a smaller diameter than the sail track between the QRTS and the boom slide, it acts as a spacer to maintain just the right separation for easy operation. He will also make the length of the slide to your specifications at additional cost. This track stop is so quick and easy to use, I’m not going back to the original stop. Now I want to replace every other knob on my sailboat with levers, such as the pop top mast lock on the first generation C-22s. Both mast gate designs work well. The one that’s right for you depends on your mast profile and how you use your sailboat. Both come in kits with detailed instructions and all the parts you need to complete the installation. You might also need common tools like pliers, screwdrivers, allen wrenches, drill, bits, and taps depending on the gate model. You can find more demonstration and installation videos on mastgates.com and YouTube. If you don’t have mast gates on your boat yet, you owe it to yourself to contact Tom at mastgates.com. He will go out of his way to set you up right, whatever your sailboat and whatever your needs. For current pricing, ordering information, world-wide shipping, and more, visit mastgates.com. For me, the fit from Tom out of the box was pretty close and, like I said in the post, worked most of the time without any further fitting. You’ll want to test them in your mast and see if they work as expected under all the conditions that you need them to work, like while reefing in a strong blow. If the slugs catch on them and tend to drag the gates down in the slot instead of passing by them, then you should custom form the gates to your sail track. It’s pretty easy to do. Thanks for your question. I hope they work as well for you as they do for me. Hello, this is Tom, of MastGates. I failed to point out that the external tethered gates each have a centeraly placed hole for locking the gate plate into its installed position by partially pushing in a nylon push pin or if you prefer, a screw. This way, a snagged sail slug won’t knock the plate off. I wondered what that hole was for. Thanks, Tom! When a feed slot area has existing holes, don’t drill new holes to match holes in gate plates. I can tell you how to accurately transpose that existing hole location to the plate for re-punching for free, just pay for round trip shipping. I just purchased the pop-in plastic sleeve from Mastgates.com. The slugs sometimes catch a little when I raise or lower the sail. Is there a product you recommend for lubricating the track? Any advice for making sure its seated properly in the track? I’ve gotten good results using McLube Sailkote in my mast and boom slots. For the mast, I tie a piece of paracord to the end of the mainsail halyard shackle. Leave the paracord end beyond the knot long enough to tie it around a small piece of rag a couple inches from the shackle. Soak the rag with Sailkote and insert it into the slot, then run it up and down the slot a couple times to coat the entire length of the slot. It’s actually easier to do with the mast up so that the lubricant doesn’t drip out of the slot onto the deck, it all stays in the slot. You might also try smoothing the inside of the sleeve a little to reduce friction. The sleeve is seated properly if both ends are inside the slot opening and the sleeve slot is the same width along its entire length. What is the part number on the sail slugs. I need to know their diameter first. When and where did you order MastGate insert. You might have an older version. The MastGate insert was built for 3/8″ and 9mm slugs. Thanks for the prompt reply Stingy. I will give it a try. I purchased the mast gate about 3 weeks ago off of mastgates.com. I believe my slugs are 3/8″. I’ve only had the opportunity to use it once so far. I’m going to use a little lubricant on it next time. How is your sail attached to the sail slug? Look at the Stingy Sailor review photo showing blue MastGate insert. Notice that the sail slug is attached with a free floating shackle attachment. This allows the pulling force of the sail to tug on the ends of the slug’s bail that drags the slug up & down with very little twist when the sail flakes. Many sail shops save on parts cost by sewing on a webbing that is tight fitting on the bail and does not provide freedom from twist drag friction. Could this be a solution to your problem?